This screen gives an overview of all documents in the RavenDB server instance. When you will enter thin screen, on the left side you will see all available collections for the current database. Each collection will be represented by a different color and a number of documents that belong to it. A Collection in RavenDB is a group of documents sharing the same entity name. It is not a "database table", but rather a logical way of thinking of document groups. From this screen you can delete a bulk of documents based on their collection association. Since a Collection is just a logical unit in RavenDB, there is no actual meaning in deleting a collection. By deleting a collection in this screen, you are telling RavenDB to delete all documents sharing the same entity name which is equal to the name of the Collection you are asking to delete. To perform this delete operation, right click on a Collection name from the list on the left and select "Delete Collection". A confirmation dialog will appear. This operation cannot be undone, and is likely to delete a lot of documents. Use this option wisely. In the right side of the view you will find a couple of buttons. The left button allows you to Export to CSV. Id Only option is recommended when using a remote server as it uses less bandwidth. By double clicking on a document in the list, or clicking on the pencil icon on it, you get to the document editing screen. To the right of the form some statistics are shown - the metadata of the current document, formatted, and a list of possible reference found in it. Clicking on a reference will open that document for editing, if it exists in your database. If no document exists in the database for the ID you provide you will be redirected to the Documents tab, otherwise the Document edit page will load with the requested document. Clicking the "New" button will open the document editing screen, but this time with empty fields. After providing a unique ID for the document and filling some data for it, clicking on Save will create it on the server. 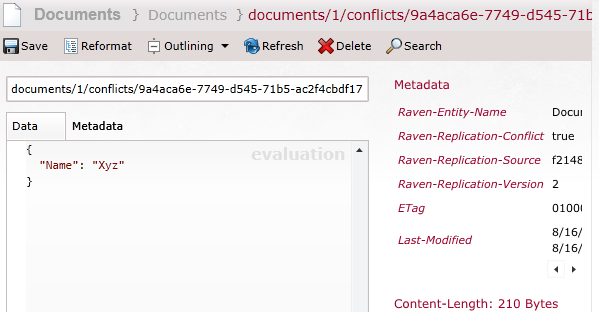 For a new document created through the Studio the Raven-entity-Name metadata attribute which sets its collection is set by the text before the '/' in the provided ID (with first letter in capital), so the a document with ID "albums/626" will be assigned to the "Albums" collection. If you have a a multi-tenant database set up, while browsing the documents in the Default Database tenant you will see one or more special documents titled "Sys Doc" with the names of the available tenants. Do not edit or delete this document - doing so might cause you to lose access to that tenant, although the actual data in it is not deleted. Here you can resolve the conflict by manually selecting the appropriate parts of the document and saving it.